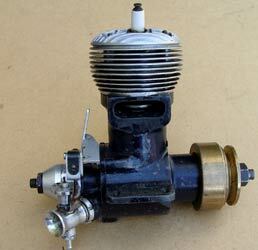 One of Edgar Westbury's rarest engines, possibly only this and another known to exist. By any standards, this flat four motor is a big, but somewhat handsome lump. It is a fine piece of engineering with the twin camshafts but is gloriously 'old fashioned' being side valve with offset plugs through the sides of the combustion chambers. Like many of ETW's motors, it struggles with small and convoluted ports and passages especially as they share the common manifold. This was another of the surprises discovered during the exploration of his daughter's garage. Not strictly a dynamometer, more of a torque reaction device. This was amongst the treasure trove of items discovered in his daughter's garage over forty years after his death. The late Euan Forbes had this motor on his stall for several seasons without it finding a new home. It is home built and looks relatively old and given the angle of the exhaust and clutch saw service in a tethered car at some stage. 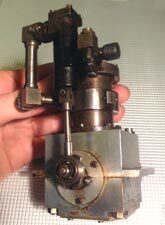 The strangler on the venturi and size of the holes would indicate that it was not the most powerful motor around and one wonders if the cylinder head was from a much bigger engine or designed like this. At around 12cc it is no miniature either, but a mystery at present. For over 25 years two motors have been at the forefront of 1.5cc tethered car racing, the Kapu and AFA. In addition Kapu cars are still the number one choice for many. The AFA is the work of Boris Afanasiev, whilst the Kapu shown here was down to fellow Russsian, Alexsander Karpusikov. Between them they won 17 World and European championships from the late 80s onward. The death of Karpusikov four years ago left a huge void in the supply of cars, motors and spares for the 1.5cc class making them increasingly scarce and valuable. The last time we ever saw Karpusikov he was still running cars despite being swathed in bandages from a very serious operation. 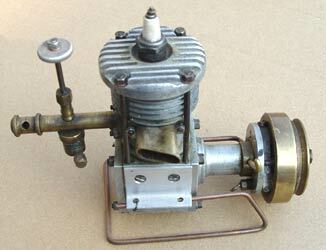 Nothing is known about this motor apart from what can be deduced from the photos. It is relatively small and from the height it could well be 15cc or even smaller. 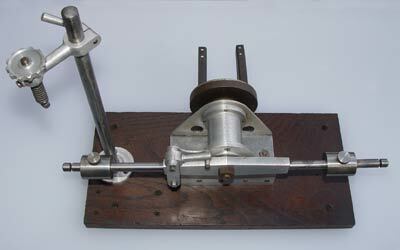 It does have parallel inlet and exhaust valves but the angled push rods would indicate lever followers on a single camshaft. 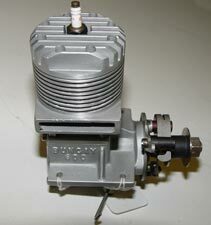 There is a starting dog on one end of the crank and a flywheel on the other yet the style of mount, commercial carburettor and throttle control probably means that it has not seen service other than for bench running. Someone out there might recognise it as a published design but the best guess is that it has been cast up as a 'one off'. It appears to have been nicely engineered and a runner, so any further thoughts would be much appreciated. 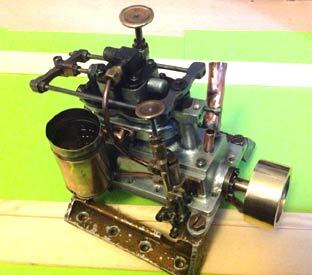 The only clue as to the origins of this single acting flash steam motor is the date 1952 stamped into the crankcase. This does help as the design follows that of Frank Jutton's motor from a couple of years earlier. The simplicity of the valve gear follows that motor almost exactly. 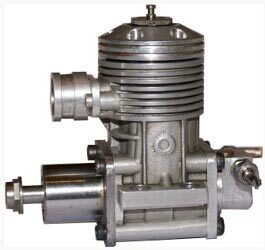 From the valve gear and the exhaust belt is appears that the motor is a semi-uniflow, indicating that it was not intended for very high steam pressures and revs. 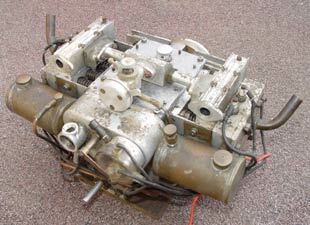 There was still a great deal of experimenting going on when this motor was built and there doesn't seem to be any provision for driving pumps so it remains something of a mystery, but another superb motor saved by Rich Gorbutt. The good news is that it should run again in a vintage style hydro. 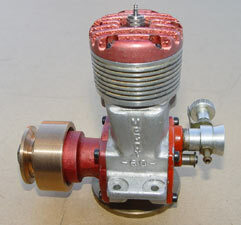 The AE was manufactured from around 1910, being refined and developed as engine technology changed. 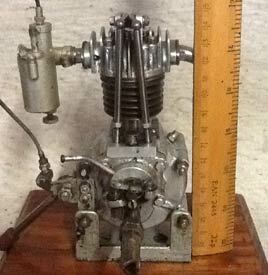 The single cylinder versions from the very earliest onward are not uncommon, both air and water cooled, but twins, such as this are exceedingly rare. 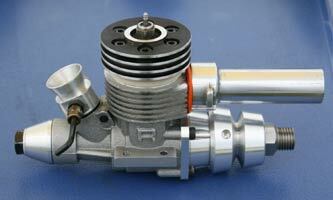 This is one of the later versions with both inlet and exhaust valves cam operated and integral ignition system. Only one other example of the twin is known to exist, which is strange as it featured in the ST catalogue for many years. The motor is currently for sale on ebay along with its impressive straight runner hull. 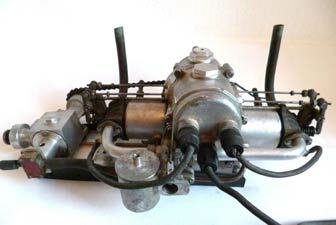 This lovely twin cylinder motor is reminiscent of the original Stuart Turner but somewhat better engineered and obviously intended for serious work. 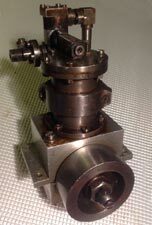 The drive for the shuttle valve is interesting as this appears to control the inlet only with the exhaust being uniflow round the base of the cylinders. The Erasmic shaving stick tube appears on numerous engines, being almost perfect size for an oil container. With the addition of the pumps and adjustable feeds this is an absolutely fascinating engine, unfortunately we know nothing of its history, other than it is another gem saved from the scrap bin by Rich Gorbutt. The arrival of the rear exhaust motor created a problem for hydro and car enthusiasts as the exhaust faced the wrong way unless built specifically, and these were few and far between, especially in the smaller classes. 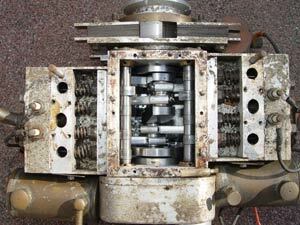 The only option was to 'turn' an aircraft motor round by making a new housing to replace the rear crankcase cover as seen here. This is still the case with Nova Rossi, Rossi, smaller Picco motors and even some marine engines that use gear drive to keep the exhaust pointing in the right direction. 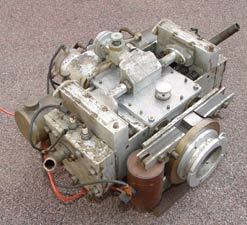 This Series 20 McCoy is one of dozens that were used so successfully in tethered hydros from the 1950s onwards. The one shown belonged to long time MPBA stalwart and 'international Secretary', Jim King. As well as the occasional run with his hydro 'Hot Toddy' that was built for him by Alan Rayman, Jim used to travel to most of the International regattas and write extensively for the specialist magazines. His hydro met an unfortunate end when he put it on the ground, forgot about it, and inadvertently reversed over it. Hence the motor sitting in splendid isolation on a stand. Hopefully, a period Lambert Hyder hull can be found so it can be returned to its rightful position in a boat.